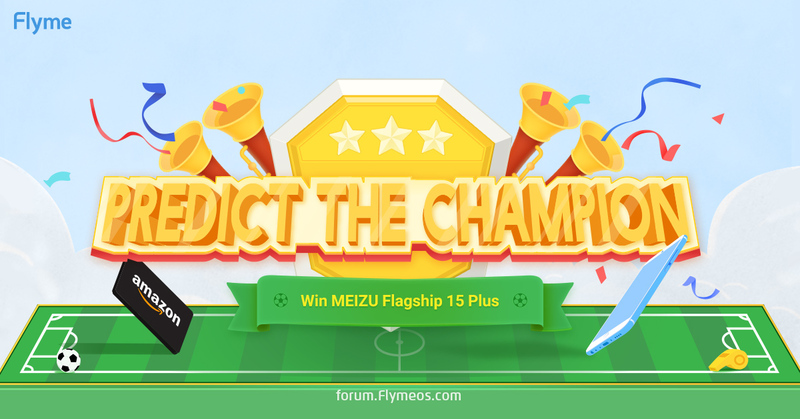 [World Cup] Predict the Champion and WIN MEIZU 15 PLUS! The 2018 World Cup has reached its destination, and France had won the cup. In total, there are 23 users who have predicted the final champion correctly. Therefore the prize for every user is 31USD Amazon card. *For those who doesn't have Amazon in their country/region, we will send the gift card from Amazon Global (amazon.com). *If a winner's country doesn't use USD as its currency, we will send the gift card of the same value based on the exchange rate of the sending date. The voting deadline for every game is still 12 hours before the game, so please stay focused and pick the game on time! Because the 1st round (Round of 16) we have missed out some users in the server, so the lucky draw was not based on the complete list. To compensate that, we will draw extra 3 winners after this whole contest is over among all participants. 1. We have updated the qualifications for users who have reported the mistaken status before July 6th, it will take some hours to be normal. To make sure users have time to vote, we have changed today's game schedule on the Quarter-finals page so users can vote for the winning team until 1 hour before the game (the page still requires you to vote 12 hours in advance, therefore the time of the July 6th games are wrong， because it enables you to vote 1 hour before the real game schedule, so it's 11 hours later than the actual game time). 2. Some users who have gained 6 or more correct predictions are worried why the page doesn't show they have Semi-finals qualifications. The Semi-finals list will be generated after the Quarter-finals are finished. Don't panic if you didn't see your Semi-finals page. Due to some network error, some users' predictions are not recorded by the server, therefore some users' contest page has shown 'Insufficient predictions' even when they've gotten more than 3 predictions. To solve this issue as soon as possible, please comment this thread with your contest page screenshot (to prove that you have already gotten 3 or more correct predictions). The admin will manually correct your qualifications later (time difference + processing time, the corrections will be taking some time). Also, please notice that if you really did not get sufficient correct predictions, you shouldn't be sending the request. Some users reported the issue that after login the page is not loading again. To better proceed in this contest, please login before you go to the contest page. Hey guys! Are you enjoying the World Cup? I see a lot of members have put down their predictions for the Final 16 teams. The result is about to be revealed soon! As we said in the last contest, our community has 2 World Cup related contest:guessing the Final 16, and a website predicting games. And now the second-phase activity begins: Champion Prediction Challenge! For users who can't wait, you can go to the game page directly and start guessing the result! The game starts from the Round of 16, user can pick the team that he thinks will win. To keep staying in the game, users have to reach certain performances. And whoever reaches the final round and guessed the result correctly will win the grand prize: a MEIZU 15 Plus! 1. To enter Quarter-finals, you will need to get at least 3 correct predictions in the Round of 16. If you get 6 or more correct predictions you will enter Semi-finals directly. If you predict all match results correctly, you will be escalated to Final round directly. All qualified participants to enter next round(s) will be displayed under this page after this round is finished. 2. To enter Semi-finals, you will need toget at least 2 correct predictions in the Quarter-finals round. If you predicted all match results correctly, you will be escalated to Final round directly. All qualified participants to enter next round(s) will be displayed under this page after this round is finished. 3. To enter Final round, you will need to predict both the Semi-finals games correctly. All qualified participants to enter next round will be displayed under this page after this round is finished. 4. If you correctly predict the result ofthe Final game, you will be the ultimate winner (or one of the ultimatewinners). 5. User or users who get the correct final champion all the way through the games will win the grand prize: a MEIZU 15 Plus (black, 6GB+64GB). If more than 1 user predict correctly the Final game’s result, the winners will split the prize and receive Amazon gift card of the split value. The price of a MEIZU 15 Plus (black, 6GB+64GB) is 700 USD. For winner(s) from regions that don't support Amazon gift card, we will send gift of the same value. 6. Lucky Draw: during the Round of 16,Quarter-finals round and Semi-finals, we will draw out lucky winners to give out $30 Amazon gift card regardless of performances. As long as you’re participating, you have a chance to win the lucky draw prize (Amazon cards of30 USD). There will be 3 lucky draw winners in the Round of 16, 2 winners inthe Quarter-finals round, and 1 winner in Semi-finals round. The Lucky Draw winner will be displayed after every round is finished under this page. 7. The game schedule displayed on the pageis Moscow time (UTC/GMT +3). The prediction deadline for every game is 12 hours prior to the start of the game. For example, if the game starts at 21:00, July11th (Moscow time), you’ll be unable to guess the result after 09:00,July 11th (Moscow time). Once you made your prediction, it cannot bechanged, however, the games are not necessarily to be guessed at once. You canmake your prediction separately for every game within deadlines. 8. The ‘Win’ button will be unable to be clicked on when the game is over, or hasn’t started yet, or when you have not gained sufficient correct predictions from previous round. 9. MEIZU Telecom Equipment Co., Ltd. reserves the right of final interpretation for thisactivity. Got the rules? GO TO THE CONTEST PAGE AND HAVE FUN! And there will be a contest for meizu 15?